Tanjung Puting is one of the natural wonders of the world. Tanjung Puting National Park is a national park in Indonesia located in the southeast part of West Kotawaringin Regency in the Indonesian province of Central Kalimantan (Central Borneo). The nearest main town is the capital of the Regency, Pangkalan Bun. The park is famous for its orangutan conservation. Tanjung Puting National Park is the largest conservation and research center of Orangutan around the World. It includes three districts: West Kotawaringin, Lamandau and Seruyan – home to about 6,000 Orangutans (the largest of the world’s remaining Orangutan population) and Proboscis Monkey or bekantan. Traveling to the wilderness of Borneo with orangutans so a sensation of its own. You may not believe this after you have been there only two days or three days, but after the fourth or fifth day something happens. Currently the main tourist area is centered on the Sekonyer River, specifically Camp Leakey. To get to the area, visitors will down the river Sekonnyer marked the presence of the Orangutan Statue with a welcome note. So here is interesting. To navigate Sekonnyer River provided transportation called klotok (river house boat). Klotok is a kind of boat designed like a floating house, inside there is a bed, toilet, food stalls, so that tourists enjoy the trip while enjoying the food and watching the natural beauty of the tropical forest. The trip by Klothok is a very exotic experience. Slowly explore the quite river by the klotok while observe the monkeys along the riverside in the peaceful afternoon. Or hanging chicken meat at the stern of the boat to see crocodiles. Its really amazing. A stay at Klotok is the standard of accommodation when we visit Tanjung Puting National Park. Here there is one hotel and some homestay, but a more authentic experience is with Live On Board (LOB) on the river house boat aka klotok. Camp Leakey has an information center that consists of various information about orangutans such as food and habits. Here is a picture of Birute Galdikas (founder of Leakey Camp) on the cover of National Geographic in 1975, and his son Fred Galdikas, who was bathing with orangutans on the cover of National Geographic in 1980. There is also a wall filled with orangutan gardens in the area around Camp Leakey. When is the Right Time to see orangutans in Tanjung Puting? The perfect time to travel to Tanjung Puting is November to December. Along with the arrival of the rainy season. Some people avoid coming there during the rainy season. In fact, during the rainy season it is easier to find orangutans because usually many trees bear fruit. If coming in the dry season, some Sekonnyer River points occur silting so that the boat will have difficulty to pass through. Also in addition to avoiding the threat of forest fires and smoke rush. Travel Destinations Tanjung Puting is located in the district of West Kotawaringin Central Kalimantan Province. To get to this destination is very easy, can be from anywhere. Because from Pangkalan Bun can directly go to Kumai Sub-district where Tanjung Puting National Park is located. To get to the Pangkalan Bun city, tourists can by land, sea and air. The airport of Iskandar at Pangkalan Bun provides daily commute to Jakarta, Semarang, Surabaya, Pontianak, and Banjarmasin. From the airport you can take a taxi about 30 minutes to Kumai port. There, klotok is waiting to take you to Tanjung Puting. If using plane, start from Jakarta, Semarang or Surabaya choose the airline Kalstar Airline, lion Air or Trigana Airline to the Iskandar Airport (Pangkalan Bun). One-way ticket prices range from IDR. 500,000 to IDR. 1,000,000 depending on season. For those who want cheaper can take a flight to Banjarmasin or Palangkaraya then continue the journey by bus. There is also Pelni Ship that directly sailed to Kumai Port from Surabaya and Semarang. usually departing 2 times a week, to ensure that their schedule can directly contact Pelni. For backpacker in Borneo, start from Banjarmasin city can ride bus majoring Palangkaraya first. Or directly to Pangkalan Bun, bus from Banjarmasin depart early to Palangkaraya then continued at 4 pm or 7 am from Palangkaraya to Pangkalan Bun. There are several bus companies that serve Palangkaraya-Pangkalan Bun routes like Yessoe and Logos, there is an option of executive bus with a tariff of about IDR. 120,000 and economy with tariff below IDR. 90,000. Dari Pangkalan Bun menuju Kumai bisa naik Taksi (Sekitar Rp. 160.000), Ojek (Rp. 25.000-40.000) dan angkot (Rp. 5.000). 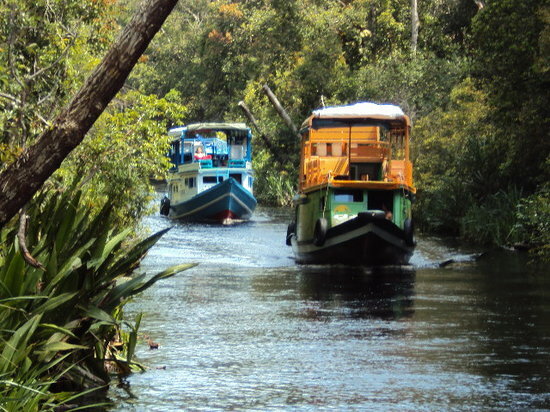 Journey through Tanjung Puting National Park must use kelotok boat. The boat rental price is rather expensive. To be more efficient backpacker can find some friends to pay the cost of renting a boat in a joint venture. It would be better if you order the ship well before departure because at peak season tour ship which amounted to about 50 pieces will leave all. The boat rental rate depends on the size of the boat and the length of the trip into the national Park area. Approximately Rp. 1,250,000 to Rp. 2,000,000 per day, there is also a package for rent per person with the cost of RP. 1.750.000 for three days for at least 4 people. If you do not want complicated, you can try to join Open Trip with Borneo Backpacker. For those who do not have much time can also rent a speedboad from Kumai depart in the morning and come home late afternoon. Do not forget to buy entrance ticket at the National Park office in Kumai before entering, there will be additional cost camera, parking ship etc. The entrance of Tanjung Puting originates from the Kumai River to the Sekoyer River and Lakey River which has a black water bar, and is a habitat for crocodiles. Tourists who want to trekking to the forest must be accompanied by a guide. There are three camps that usually become a place to see the Orangutan during feeding time that is at Camp Tanjung Harapan, Pondok Tanggi and Camp Lakey. The feeding hour at Camp Tanjung Harapan at 14.00, at Camp Pondok Tanggi at 9.00 and at Camp Lakey at 14.00. But remember, this region entered in two time zones ie WIB and WITA. Talk about which route to visit first with your guide to avoid wasting time. Buy souvenirs at Tanjung Harapan Village, here souvenir shop cooperatives are managed by the local community. Bring anti-mosquito lotion because especially in tanjung Harapan will be so many mosquito which disturb during trakking. Although there’s a comfortable ecolodge on the river bank at the edge of the park, there’s also the option of sleeping on the deck of your boat under a mosquito net, at one with the sights and sounds of the jungle. The Rimba Ecolodge is perched on the edge of the Sekonyer River and is surrounded by forest. The rooms, restaurant, and main lodge are built on elevated platforms. There are no roads: access is only by boat from the Port of Kumai.